Format: Live, in-person lectures and workshops, (if in Vancouver, Canada area) and simulcast on Skype. Please note: Course fee includes the two e-manuals "Practical Tarot: Reading Made Easy" and "The Soul Oracle Cards Course Manual". This class is open to everyone. You do not have to be an advanced student to take this class. Supply your own tarot cards, and purchase your deck of Soul Oracle Cards directly from Dr. Michael. Allow 3-6 weeks for delivery. 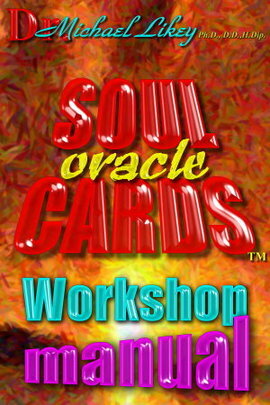 The Soul Oracle Cards e-manual which is included in the price of the course has full-color reproductions of the Soul Oracle Cards for your reference/study, regardless of whether you own the cards or not. The Soul Oracle Cards are the easiest way to get spiritual guidance, especially if you’re stressed, worried, or sensitive to the energies of this earthly world. This online course is suitable for those who are new to the tarot and the Soul Oracle cards, as well as seasoned pros. Dr. Likey, Ph. D., D.D., and H.Dip. offers this advanced course on how to get detailed, accurate, and inspiring information from both his Soul Oracle Cards and tarot cards in general. 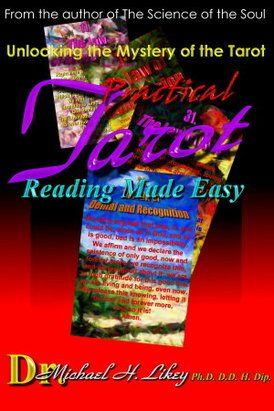 *As an added BONUS, in addition to receiving Dr. Likey's TWO e-books, "Practical Tarot: Reading Made Easy" and "The Soul Oracle Cards Course Manual" ($20. value) upon registration, if you complete this course, you'll receive a Certificate of Attendance, suitable for framing, and validating your participation in the class. The course begins with Dr. Likey guiding you through the interpreting of the symbology in the Major Arcana section of the Tarot cards. Symbology is a powerful connection to the subconscious and the spiritual, and Carl Jung referred to the unconscious part of the mind that houses the myths/symbolism/metaphors we are born into as the "Collective Unconscious". During this class, Michael will discuss the energetic influences of such things as "Death", "The Hanged Man", "The Tower" and many more within the Major Arcana. You will learn how to focus on which aspects in a card are important to a reading as well as how to research and connect with the powerful world of symbolism, myth, and metaphors. The overall structure of the Soul Oracle Cards and the tarot are also reviewed, as well as cards 1-10 in the Soul Oracle Cards. Exercises and meditations are also included. This week’s lesson focuses on the symbology, structure, and interpretation of the Minor Arcana section of the tarot, as well as 11-20 in the Soul Oracle Cards. What is the connection between the cups, swords, coins, and staves of the tarot, and the modern-day deck of playing cards? What happened to "The Fool"? Procedures/intention/clearing/"sacred space" before and after giving a reading, as well as cloth-bag vs. cloth vs. box, superstition, 3-card spreads, gypsy card-spread, the celtic-cross spread, 9-card spread, and astrology spread are covered. Exercises and meditations are also included. During this lesson, we continue interpreting the rest of the tarot's Minor Arcana, and Soul Oracle Cards 21-33. You’ll create your own unique spreads, and you'll be guided on doing readings on such topics as relationships, career, home, health, and life/soul's purpose. Michael will also explain key aspects to the tarot and Soul Oracle Cards that represent our day to day lives. Scientific/Affirmative Prayer and the Soul Oracle Cards, exercises and meditations are also included. Dr. Michael Likey has shown hundreds of his patients, clients, and students how to follow/uncover their Divine/Soul's Purpose by creating careers based on giving readings and helping those in need. In this class, Michael will discuss how to build a business as a metaphysical/spiritual reader/healer. Michael will also talk about how he made the transition from Advertising/Graphic Artist to spiritual teacher and tarot card expert. Knowing your market, dress/image and professionalism, advertising vs. publicity, portability, designing your business cards and flyers, social media, radio and television, and more are covered.